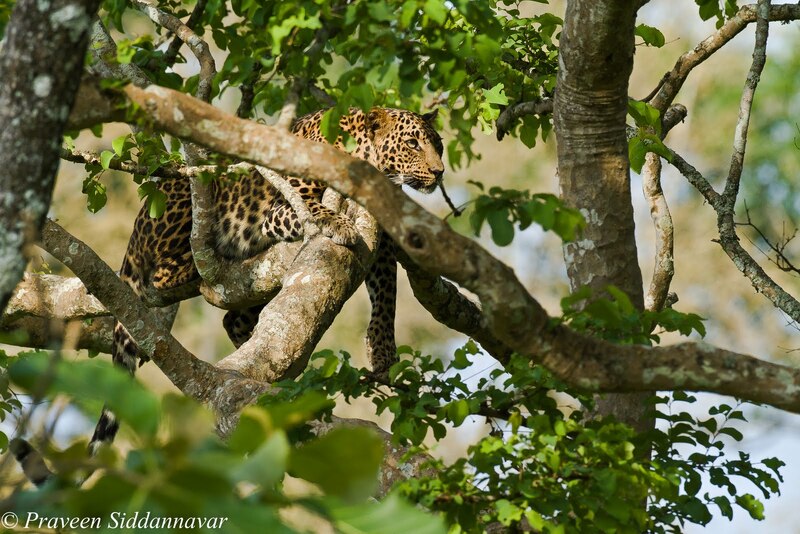 Praveen Siddannavar's Blog: A Lazy Leopard on Sunday! Another day in the forests of Bandipur Tiger Reserve, Karnataka State, India. It was Sunday morning during the peak summers and I was on my usual game. 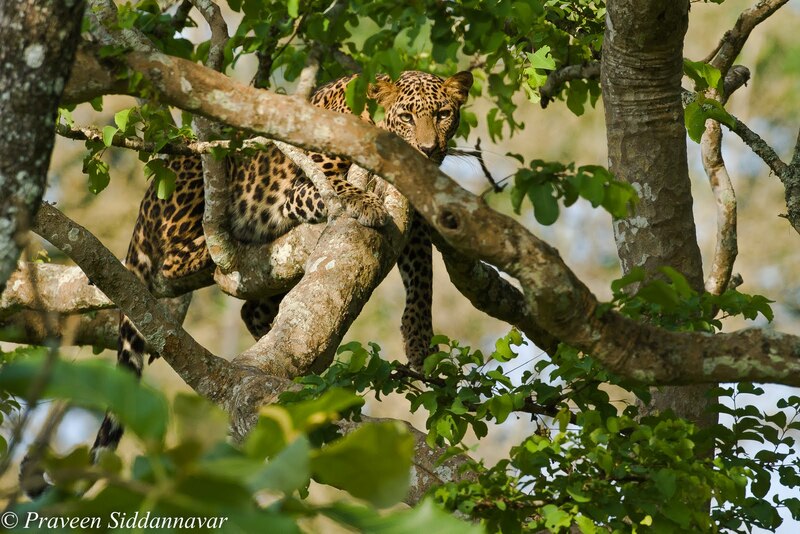 We had Basavanna - Senior Naturalist of JLR with us, having heard about a kill made by a huge male leopard. I was keen to spot it and capture in my camera. However despite so much efforts we couldn’t track this cat. During our I was inquiring with Basavanna about tiger sightings he replied it was very dull for past few weeks, so it was pointless to make any attempt to go after tigers. We approached the minister gutthi road and suddenly heard a langur (black faced monkey) alarm call. We stopped the jeep and were looking around in all directions; I and Basavanna kept a keen watch on every tree, the alarm calls went on quite loud and this time not by one langur but by a group of at least 5-6. 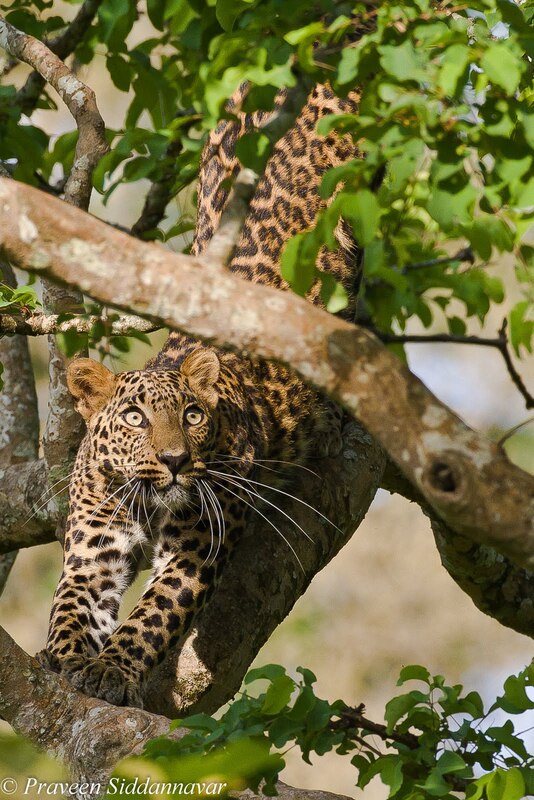 The excitement began, we were quite sure that a predator more likely a leopard is around. The minister guthi route is surrounded by dense trees, and it was making all the more difficult for us to spot and then after a while we spotted the leopard on a tree, it wasn’t so easy to see it clearly as the leopard was resting on a tree branch in a dense area covered by leaves. 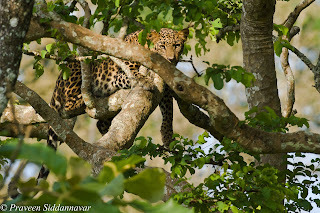 It was a female leopard this time, she was sort of disturbed not by our presence but mainly by the langur alarm calls. She woke up and first thing she did was to stretch her body, typical a lazy stretch that we do on a Sunday morning. We spotted the leopard on my right, so my position wasn’t that great to shoot. So I actually had to place my bean bag on the roof top of the jeep, balance on the foot rest of the door and shoot. Not at all a comfortable position, but when you have such a beauty in front these things don’t matter much. One needs to keep in mind to change the position of the jeep as required, here we didn’t do it because there was risk of leopard shying away and disappearing into the bushes.Since the leopard got up from her resting position the langurs panicked even more and now they were not only giving alarm calls but were seeing jumping from one branch to the other, typical monkey’ing all over.This is quite obvious; at times leopards are so quick and are quite capable of killing the langurs on a tree. And of course we have records of such kills both at Bandipur and Kabini. 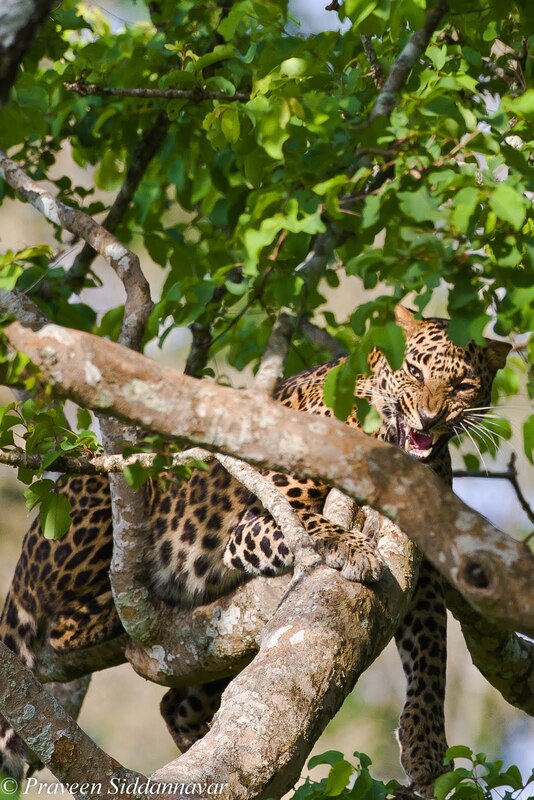 I captured some annoying moments of this leopards that can be seen in images. 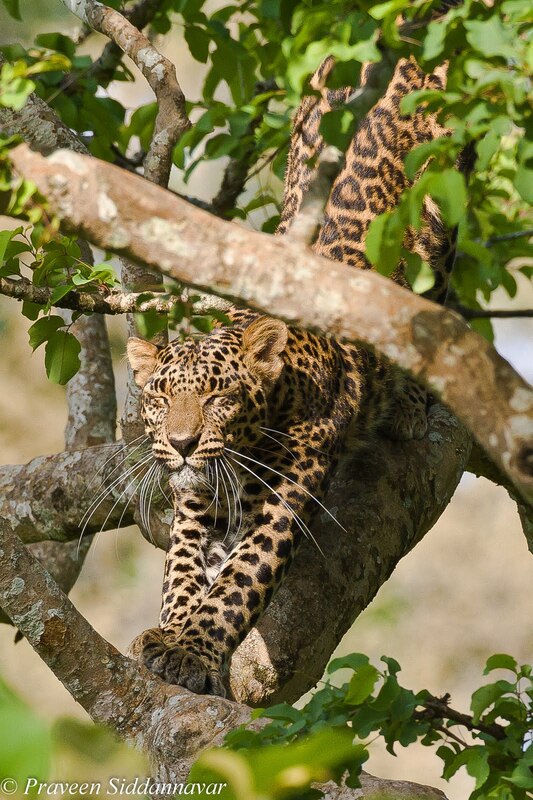 The alarm calls never stopped, it went on and on, the leopard had enough of this non-sense on a Sunday morning. So she decided to climb down the tree and disappeared into the bushes. While she was descending the I tried to click few images unfortunately the images got under exposed.